Hello, sweet friends! I'm so glad you've stopped by today as I share a card I started creating last night, and finished up this morning (after my vanilla latte). This card was a lot of fun to make, and I hope you like it. The base of this card is a piece of vintage sheet music that I dusted on the edges with Tim Holtz Hickory Smoke Distress Ink. Next, I used PTI's Matting With Glitter tutorial to create the mat for my card. Next, I added a piece of Echo Park Victoria Park patterned paper, and then I placed a true vintage button card on my card, and attached several vintage buttons from my stash. 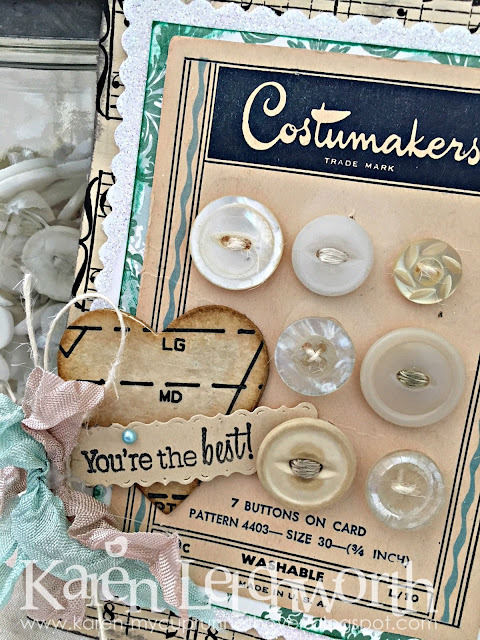 When I'm using true vintage items, I like to keep it authentic; so I used actual "antiques" for the buttons, sheet music, dress pattern and button card. Once I had the buttons glued on, I cut a heart from a vintage dress pattern using the PTI Heart Prints Die (largest heart) and backed it with a PTI Cardboard Coaster to give it some girth. The sentiment is stamped onto a scrap from the vintage sheet music, and is stamped using the PTI Flower Fusion #5 Stamp Set (You're the Best). I added a bow using seam binding and Cream Button Twine. There's also some Cream Button Twine tied into some of my vintage buttons (the ones that didn't have the original vintage string still attached). The mat I created using the Matting With Glitter Tutorial is sprinkled generously with Prisma Glitter from PTI. Nichole Heady's Capture The Moment - Papertrey Ink Blog - Challenge #301 - Matting With Glitter By Melissa Phillips. I used several PTI products on this card. See details/links above. CropStop - Challenge #33 - I used lots of Tim Holtz Distress Inks (Black Soot, Hickory Smoke and Corduroy), and my Tombow Adhesive. D.L.ART Thankful Thursday - Challenge #215/Ribbons and Sparkles - I have both! I used some gorgeous seam binding, and I glittered my mat. 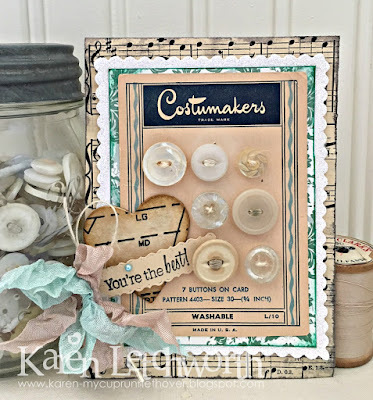 Wow, stunning card and beautiful vintage buttons...great way to display them, the added glitter is a perfect fit! What a gorgeous card Karen - love the soft feminine colours. 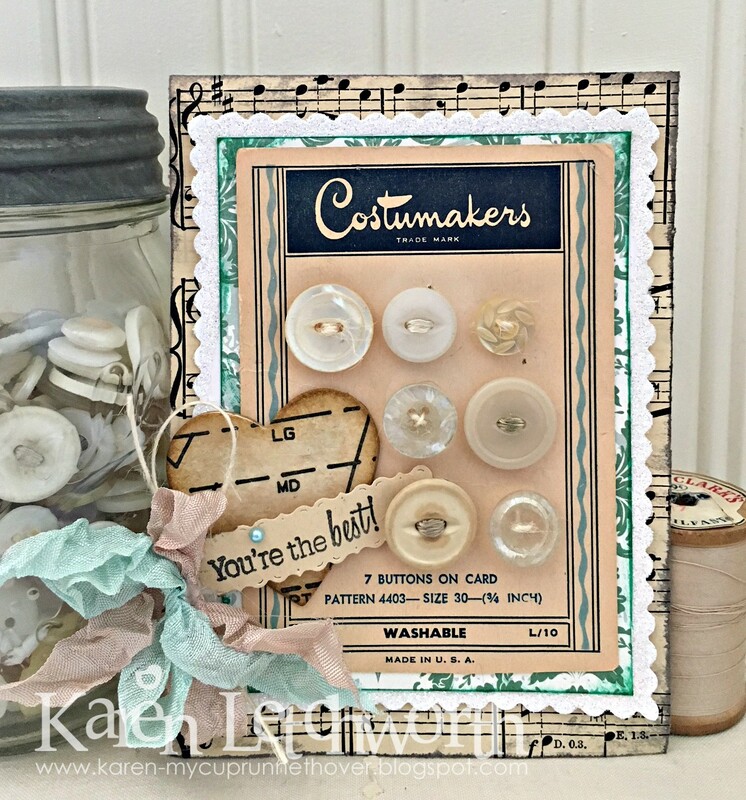 Oh I love those truly vintage button card and buttons! The older I get the more I love antiques/vintage stuff - so your card caught my eye right away! Thanks so much for linking this beauty up to the Cropstop blog - always a pleasure to have you play along! You know just how to use layers & beautiful elements, Karen--wonderful work! PS--just saw that you were one of the SSS WCMD winners--how exciting! Karen, your vintage card has me swooning! Adore the simple aged coloring, and beautiful framing! Gorgeous! 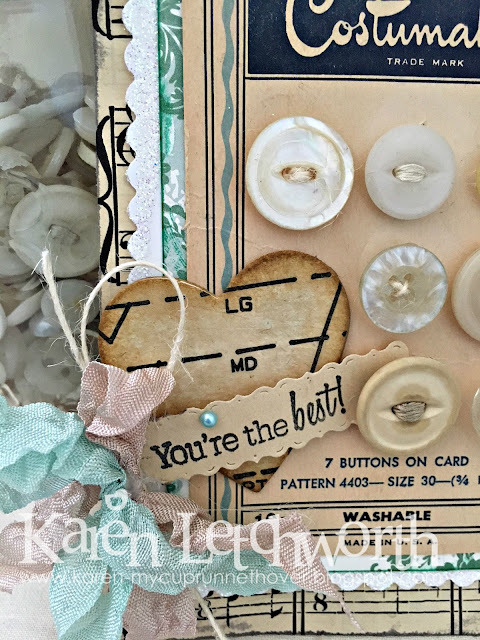 Gorgeous vintage card Karen! I love the layers, vintage buttons, colours & bow, everything is just perfect & beautifully created. The buttons look so beautiful on this card, I love the dimension and all the pretty details are amazing.